Today was pretty warm in my house, and I have to do laundry, so I started pulling out some clothes from the depths of my wardrobe. 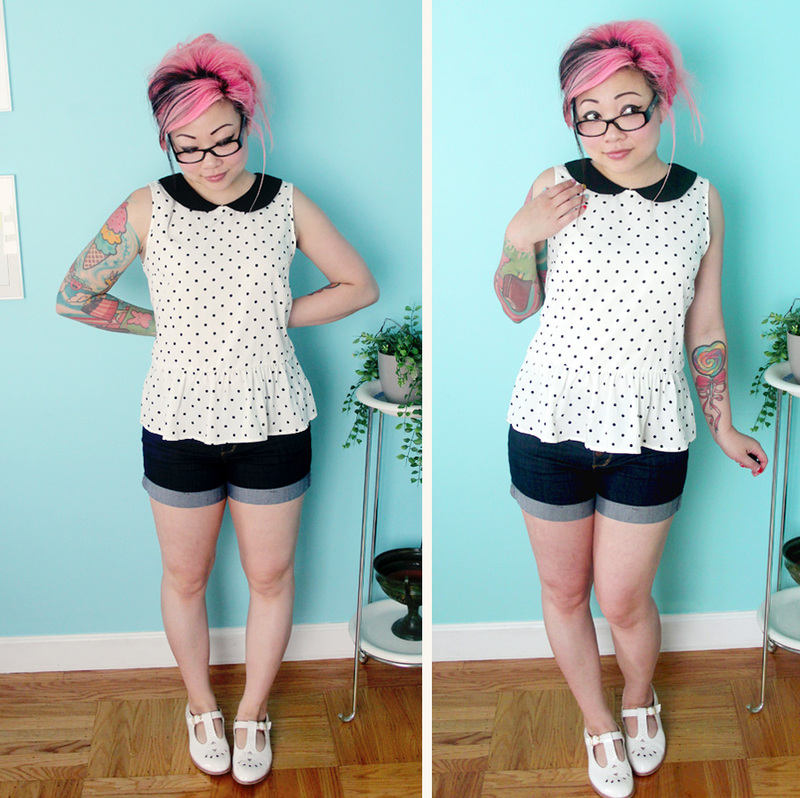 This cute peplum top is really fun. I love a peplum on a shirt! And I love me some polka dots! BUT, it buttons in the back, so I have to dislocate my shoulder and grow a third arm to button my own shirt. I realize there is an element of narcissism with selfie-culture and with outfit photos, but I think the positive side of that is making an attempt to love your body and be okay with workin’ with what ya got and letting other people know it’s ok for them to wear shorts, too. I especially wanted to post the shorts because they look kind of flared out at the bottom on some people, but on us juicy-thighed mamas, they are still pretty snug all around! They are definitely stretchy, tho, so they are not torture chambers of denim. This entry was posted in What I Wore Today. Bookmark the permalink. Soo cute. I love the little frill at the bottom of the shirt. It’s funny, we can be really self conscious about certain parts of our bodies and no one else even notices! And you don’t have cankles! Aww, all the stuff you’re worried about, I think is super cute! Your legs look totally fine (for any age!!) and I actually love the updo – I wish I could do stuff like that with my curly hair, but it always ends up looking awk. Thanks for posting stuff like this despite insecurities – we all have them! You look adorable, as always. Love peplums, love polka dots. You can wear anything! you are gorgeous!